I am going to start this post by fully admitting that this recipe is not healthy, not even a little bit. I like to live by the 80/20 rule with eating, 80% of the time I am really good, and 20% of the time I am not so good. Typically that 20% falls on the weekends, especially in the summer. These onions strings are definitely smack dab in that 20%. Now that I have that disclaimer out of the way, I want to tell you to make these right away! They are not beautiful, notice I didn’t even try to take a pretty picture, but they are to die for good. I am currently in the final days of my summer family vacation. We have had an amazing time and I am fully focused on making the most of the last few days. Tonight is the annual Lake House Chef's Challenge, more to come on that later! We had these onion strings on hamburgers this week and everyone agreed it was one of the best burgers they had ever had. Make more than you think you need, like a lot more. 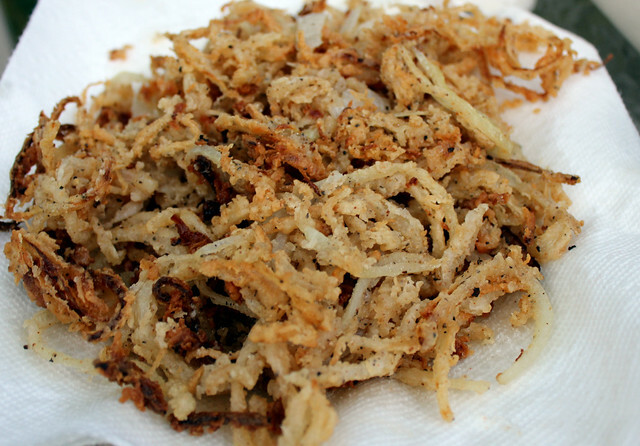 Once everyone gets a whiff of fried onions they magically disappear from the plate. 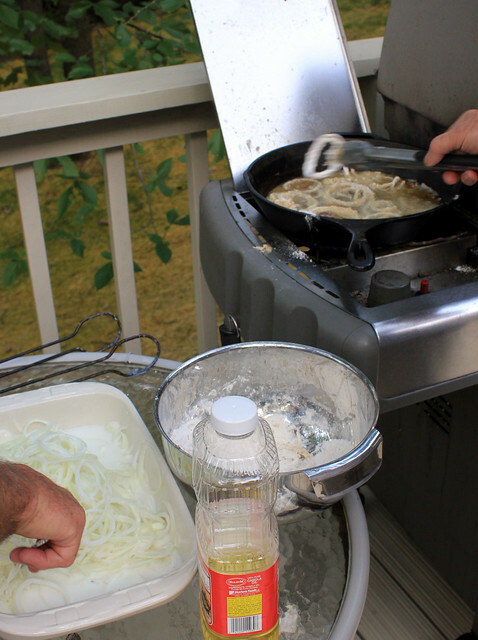 If possible, fry on an outside burner. This eliminates a lot of mess, and your house won’t smell like fried food. We use a cast iron skillet on a grill side burner. Season your flour with salt, pepper, and cayenne. Use more than you think you will need. Get your oil really hot so they fry quickly and do not absorb too much oil. I wish I could tell you the exact temperature of the oil, but the thermometer was nowhere to be found. The oil should be around 375 degrees. You can test it by tossing one onion in the oil. If it bubbles up immediately and violently, it is probably ready. If it acts bored, probably not ready. Salt the onions strings liberally right after they come out of the oil. I soaked the thinly sliced onions in buttermilk in a 9x13 so they were evenly covered. We tossed them in the flour mixture right next to grill and dropped them directly into the oil. And when I say we, I mean my dad and uncle. 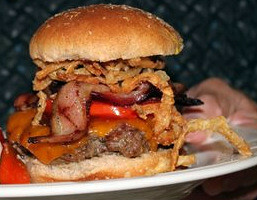 The Perfect Pairing for onion strings is a hamburger. Slice the onions very thin and place in a 9x13 dish. Cover the onions with buttermilk and allow to soak for at least 45 minutes to 1 hour. 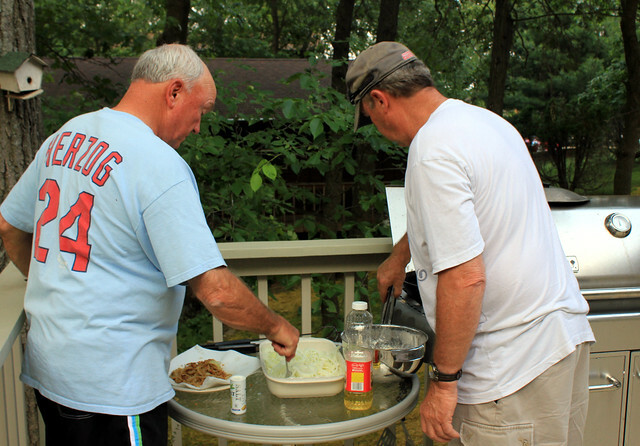 Toss the onions with tongs so they are evenly coated. Meanwhile, add the flour to a large bowl and season with salt (1 to 1 ½ Tb), pepper (2 tsp), and cayenne (1/2 tsp). Stir with a fork to combine. Bring the oil to a high temperature, at least 375 degrees. 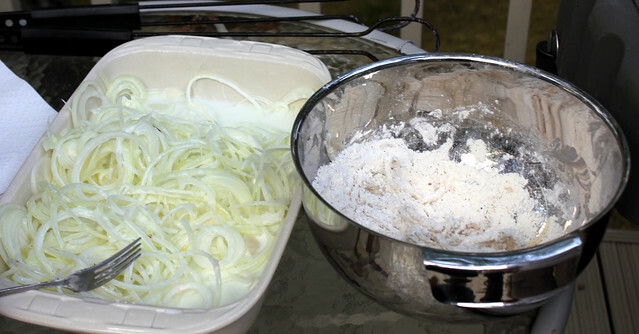 Place the soaking onions and flour near the hot oil. Remove the onions from the buttermilk with tongs and toss in the flour until coated. Add the onions to the oil carefully. Once they are golden brown, remove to a plate lined with paper towels. Season liberally with salt. Repeat in batches until all of the onions are fried.